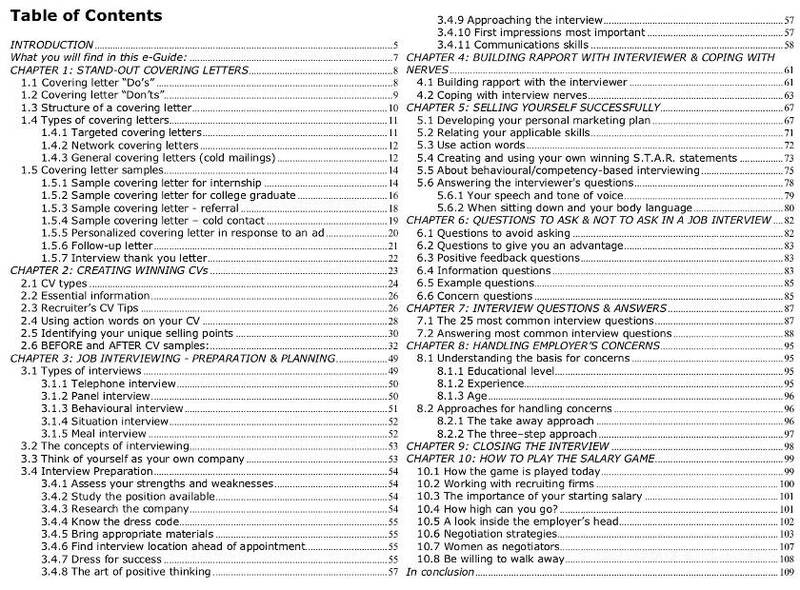 Discover the secrets of successful interviewing... with my simple and comprehensive e-Guide! Whether you’re only starting to look for your first job, or have been working for many years, you’ll want to read this. Tell them exactly what they want to hear so you get hired! Do you want to come off as "poised" and professional? Then PREPARE YOURSELF! ... Job interviews are tricky. They're going to be asking you for specific examples. They're going to be asking you for details, including names of people, dates, and outcomes. They'll ask you about lengthy projects you've been involved in - how your role evolved, how you handled deadlines, how you handled pressures and difficult personalities. Are you someone who knows that you are excellent at what you do, yet you sometimes struggle with interview performance and are then disappointed that you don’t get the jobs you really want? The truth is, there are lots of highly-qualified and experienced people who have no idea how to ‘sell’ their skills and experience effectively to prospective employers. Would you like to learn some tips and techniques that, if you apply them, will skyrocket your chances of getting any job that you interview for? Would you like the interviewer to be 100% convinced that you are THE best person for the job? Imagine how much easier it would be if you knew what to do and what to say for the best results possible! Let me show you how to prepare for your interview so that you Land That Job! With the information contained in my 100+ pages “Land That Job” e-Guide, you are in a better position to accelerate your goal of finding a great job sooner than you think. What will you find in this e-Guide? 5 Covering letter samples + thank you letter and follow-up letter samples. Learn how to structure a covering letter if you are a college graduate, applying for an advertised position or an internship or when you are emailing a cold contact. Why you might want to listen to me? 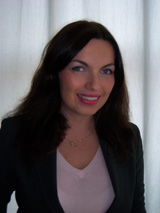 My name is Margaret Buj and for the past 7 years I have been working as a professional recruiter and head-hunter helping people like you find the career you want and deserve. I have recruited for the leading companies in the technology space such as Cisco Systems, Microsoft, VMware or TIBCO Software across Europe, Middle East and Africa. In the last 5 years, as an Interview Coach, I have successfully helped my clients enhance their marketability and get the jobs they really wanted. Within these combined roles I have interviewed hundreds of professionals from all walks of life, both from public and private sectors, looking to enhance their careers. I am therefore able to use in this e-Guide information and examples from different industries. Do you know that some job postings attract well over 100, or even 200 applications? How do you make your CV stand out? And even if you get invited to an interview, chances are the employer is interviewing at least 5 other, equally qualified candidates. There are more candidates applying for every job these days and therefore it is more important than ever to make yourself stand apart from other job seekers to beat the competition. “I just wanted to let you know that I did get the job I applied for, and am starting next month. Thank you very much for your help with the interview preparation. It was extremely helpful to practice answering questions - you gave me some really useful feedback and I felt so much more confident and prepared, especially after the second session." I want you to get full value from “Land That Job” and to not have any second thoughts about whether or not you should order it right now. When you purchase “Land That Job!”, you’ll be able to immediately download it right over the Internet - even if it’s 3 o’clock in the morning! No shipping, no handling, you get the product right away. Request an easy automatic instant refund if you are not 100% satisfied – and you can still keep this guide. I honour a 30-day, no questions asked money back guarantee. You can purchase with a credit or debit card or use your PayPal account. Just follow the instructions for an instant download. If you don't have or don't want to open a PayPal account, don't worry. Just enter your contact details on 'Billing Information' page, click on 'Submit Order', and on the next page you will be able to make payment using your debit or credit card. Margaret Buj is an Interview Coach and a senior recruiter, with experience of recruiting across Europe, Middle East & Africa for leading organizations in the technology sector, including Microsoft, VMware, Cisco and Business Objects.